Metropolitan PHILIP writes letter to President Barack Obama concerning the bishops and nuns who have been abducted in Syria. Kidnapped nuns from Saint Thekla's Monastery in Syria freed. Metropolitan PHILIP speaks on NPR Boston about Syrian conflict. His Eminence Metropolitan Philip was interviewed this week by Boston's NPR radio station for their Here and Now program concerning the plight of the ancient Orthodox Christian communities of Syria. The interview is available for listening, and as a written transcript, both available here. Military acts are increasing in our beloved country Syria and Man pays a high price for this tragedy. So we see destruction prevailing in all the country and we see Man pained, displaced, hungry, thirsty and missing life in all places and at all times. One aspect of this tragedy touches the village Maloula and her Monastery of St. Thekla, a place of pilgrimage which witnesses to the continuous Christian presence of love from the first centuries of Christendom, in the one part, and testifies also to the deep relationship which links citizens to whatever religion they might belong. The Monastery of St. Thekla in Maloula, a cultural monument, which belongs to all Syrian citizens, and at the same time, an international heritage belonging to all humanity, lives difficult and painful days at this time. The monastery is located in a region where there is exchange of fire and this renders it very difficult and dangerous for it to be provided and supplied. Recently, this exchange of fire damaged totally the electrical generator rendering it impossible to supply the monastery with water and threatening, therefore, the survival of this place. We know that the presence of the monastery is a clear reminder of Love, peace and brotherhood between all citizens. We insist that we remain there to witness to our love in the country and to its sons and to express to all our total refusal of violence and its damaging effects toward people and the physical environment.Mindful of this, we appeal officially and urgently to the Syrian Red Crescent, the International Red Cross and all the governmental and non-governmental organizations with capacity in human affairs to provide those living in the monastery, namely, the nuns and the orphans, whose number is 40 persons, with essential supplies by sending one or more relief cargoes. In this way, the inhabitants will remain in their monastery and village to witness to our close relations with each other deep rooted in this land which we love. We appeal to the consciences of all in the saving of blood, the refusal of violence, the laying waste of all the monuments of the splendor of Syria and the avoidance of their damage and destruction. We repeat our invitation to all the sons of the same country to adopt dialogue as the only way to deal with the debated issues so that the respect, freedom and dignity of men shall be observed always. In these difficult days, the hearts of the faithful in the church of Antioch pray to St. Thekla, whom we commemorate today, and they ask her to protect Maloula and the sons of Maloula and to overshadow her monastery, her nuns and her orphans with her protection. 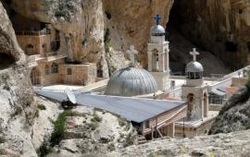 May God protect Maloula, Syria and all the world and overshadow the creation with His Divine Peace. His Beatitude JOHN X, Patriarch of Antioch and all the East Calls for Day of Antiochian Solidarity on September 15, 2013. To read his Pastoral Letter on this event please click here. Metropolitan PHILIP asks faithful of the Archdiocese to please contact their elected representatives and urge those in the Administration and Congress to not use military force in Syria. To read his appeal please click the letter to the left.